My F-Ed Up Apartment Building - ZineWiki - the history and culture of zines, independent media and the small press. 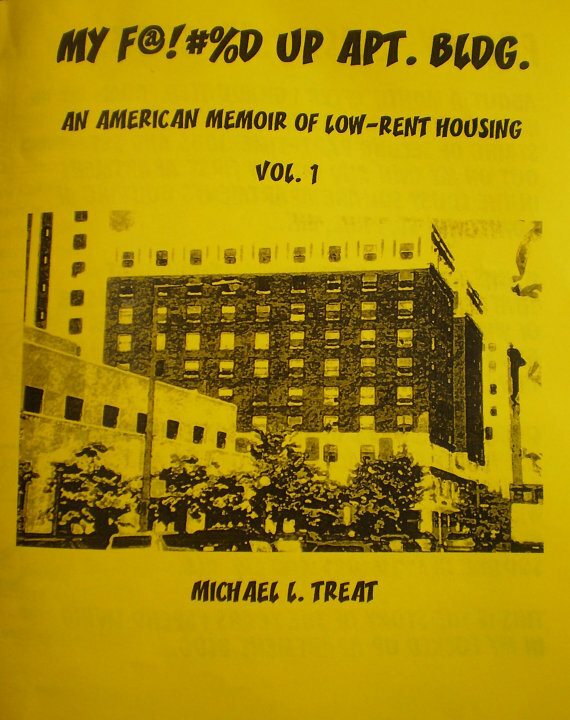 In the fall of 2013, Michael Treat published his first original zine entitled My F@!#%d Up Apartment Building: An American Memoir of Low-Rent Housing, Volume 1. This zine is an original work written and illustrated by Michael Treat. This zine chronicles Michael's experiences after he moved into his first apartment building. The events listed are non-fiction and based on his experiences living in St Paul, MN., U.S.A. The stories here sound made up, but they are actually true, proving that sometimes truth is indeed stranger than fiction. This work debuted at the Twin Cities Zinefest on 9/21/2013. This zine is hand illustrated and is 24 pages long. It is printed on legal sized paper (11" x 14") folded over and stapled into a zine. The hand drawn illustrations are black and white, and the cover is bright yellow. This zine also includes a hand drawn front cover and hand drawn back cover. Later in 2013, Michael published the second volume, cleverly titled "My F@!#%d Up Apartment Building: An American Memoir of Low-Rent Housing, Volume 2." This zine is hand illustrated and is 24 pages long. It is printed on legal sized paper (11" x 14") folded over and stapled into a zine. The hand drawn illustrations are black and white, and the cover is bright yellow. This zine also includes a hand drawn front cover and hand drawn back cover. [Zine Pick up a paper copy or an online copy of "My F@!#%d Up Apartment Building: An American Memoir of Low-Rent Housing" Volume 1 and/or Volume 2 in the zine section of the Smirking Tiger Etsy shop]. This page was last modified on 6 July 2014, at 02:06.